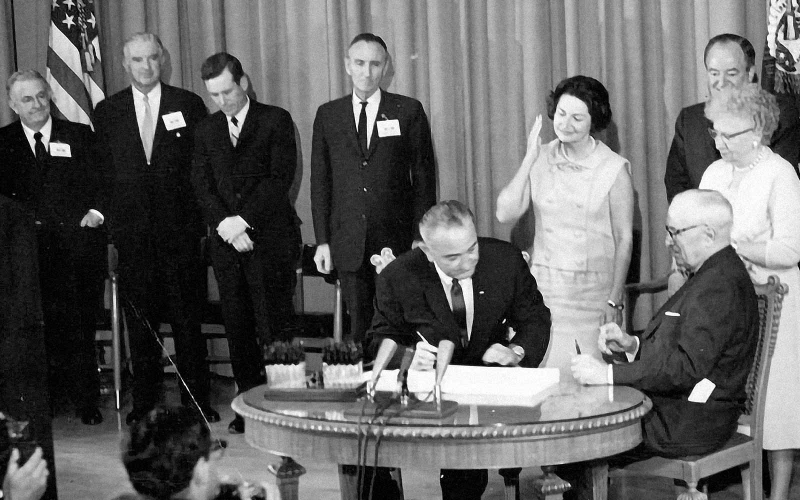 Medicare, signed into law in 1966 by President Lyndon B. Johnson, was a landmark advancement in health care for the United States. With at least 55,000 people receiving Medicare in San Luis Obispo County, plus another 67,000 in Santa Barbara County, it’s no understatement to say that the program is important—not only to our Central Coast communities, but to our nation as a whole. History teaches us why things are the way they are and how the present is influenced by the past. Learning more about Medicare—its origins, and how it has improved health care for so many Americans—is important because it demonstrates its significance to a whole new generation who, in turn, will benefit from Medicare in the future. A little known fact today is that Medicare was a direct descendant of the Dependents’ Medical Care Act, passed in 1956 to provide medical care for families of military personnel. Four years later, in 1961, President Dwight D. Eisenhower held the first White House Conference on Aging during which a health care program for social security beneficiaries was proposed. In July of 1965, congress enacted Medicare and Medicaid under Title XVIII of the Social Security Act. Later that month, on July 30, 1965, President Lyndon Johnson signed the bill into law. The bill provided health insurance to people age 65 and older regardless of income or medical history. The first two people to become Medicare recipients were former President Truman and his wife, former First Lady Bess Truman. President Truman paid $3 per month for their Medicare coverage, which was deducted from his monthly social security payments. In 1966, Medicare ended the racial segregation in thousands of waiting rooms, hospitals, and physician practices by making payments to health care providers conditional on desegregating services and facilities. Medicare: Who Runs It and Who Pays for It? Today, the Medicare program is operated and monitored by the federal Centers for Medicare and Medicaid Services (CMS), a branch of the Department of Health and Human Services (HHS). CMS also monitors Medicaid programs that are offered by each state. The Hospital Insurance (HI) Trust Fund that pays for Medicare Part A benefits and Medicare program administration, including fighting fraud and abuse. The Supplementary Medical Insurance (SMI) Trust Fund that pays for Part B and Part D benefits and Medicare program administration, including fighting fraud and abuse. The HI Trust Fund is funded by payroll taxes shared by employees and employers, taxes on self-employed people, income taxes on social security benefits, Part A premiums from people who are not eligible for free Part A, and interest earned on the trust-fund investments. Medicare Part B and Part D premiums, along with funds authorized by Congress and other sources (such as interest earned on the trust fund investments), fund the SMI Trust Fund. Beginning in 1966, workers paid 0.35% of their earnings into the Medicare system. The Medicare tax hit 1% in 1973, and the current 1.45% went into effect in 1986. Employers pay a matching percentage. Beginning in 2013, workers earning more than $200,000 ($250,000 for couples) paid an additional 0.9%. Self-employed workers pay 2.9% of earned income into the trust fund. As a point of interest, in 2014 just the Part A contribution of local workers and employers to Medicare from San Luis Obispo County was more than $7 million. Before Medicare, older adults often paid over three times as much for health insurance as younger people. Approximately 60% of people over age 65 had health insurance, but the rest could not afford it. Today, many are eligible for dual coverage by both Medicare and Medicaid. By July 1966, more than 19 million people were enrolled in Medicare—or roughly 8% of the United States population for that year. Today, Medicare serves approximately 56 million people, or about 17% of the population. Congress expanded eligibility to younger people with permanent disabilities and people with end-stage renal disease. In 2001, it was expanded to cover younger people with Lou Gehrig’s disease. Over the years, Medicare has included benefits for speech, physical and chiropractic therapies. In the 1980s, the options of payments to health maintenance organizations (HMO) was added. The HMO option was formalized in Part C under the Balanced Budget Act of 1997. Medicare Part D was passed and signed by President George W. Bush in 2003. Can Medicare help you the same way it has helped millions of Americans for well over half a century? If you’re new to Medicare or thinking about getting started, we can help! For 40 years, we’ve been specializing in serving Medicare-eligible people in San Luis Obispo County and beyond by helping them navigate the Medicare and private-plan insurance systems, and helping them get the best possible access to health care. To find out more about Medicare or to schedule a FREE consultation, contact us today!